The Resilient Sound Isolation Clip 2 • (RSIC-1™ with 3/8″ spacer) provides a cost effective alternative for wall assemblies where door frames may occur. By using the RSIC-2™ the finish wall over all thickness remains an “INDUSTRY STANDARD” thickness. Therefore, NO custom made-to-order components are required. The RSIC-2™ has an overall thickness of 2″. When added to a conventional 2″ × 4″ wall framing the new overall thickness of the framing becomes 5-1/2″, the standard thickness of a 2″ × 6″ stud wall. 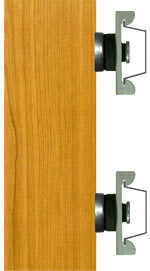 This allows for the use of standard off the shelf door frames and window casings. Thereby STANDARDIZING the components in the assembly and controlling associated costs related to the wall thickness.